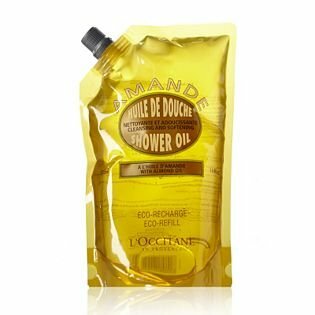 L’Occitane Almond Eco Refill Shower Oil 500ml (REFILL). This shower oil, when in contact with water, transforms into a lavish, softening foam–original and unique in texture–that leaves a satin-like softness all over the body. Enriched with almond oil, it respects the hydrolipidic film and leaves a subtle and mouth-watering scent of fresh almond, for a delightful skin! This shower oil, when in contact with water, transforms into a lavish, softening foam–original and unique in texture–that leaves a satin-like softness all over the body. Enriched with almond oil, it respects the hydrolipidic film and leaves a subtle and mouth-watering scent of fresh almond, for a delightful skin!